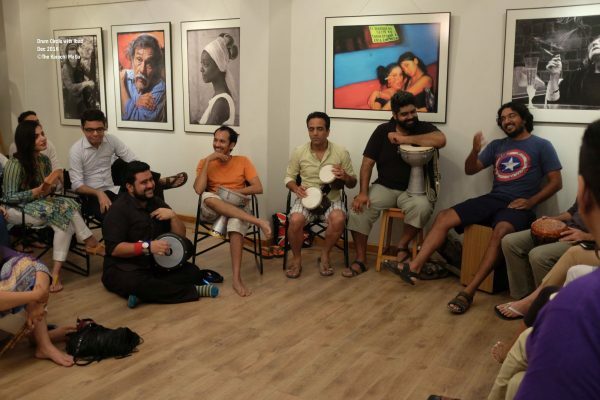 It’s another fun week in Karachi with an international flavour as Comedy Masala comes back to town and the international 48 Hour Film project screens all the entries from their Karachi competition which took place last weekend. Ammara Khan is bringing her latest collection to Karachi and there’s a slew of Halloween-themed events for kids. 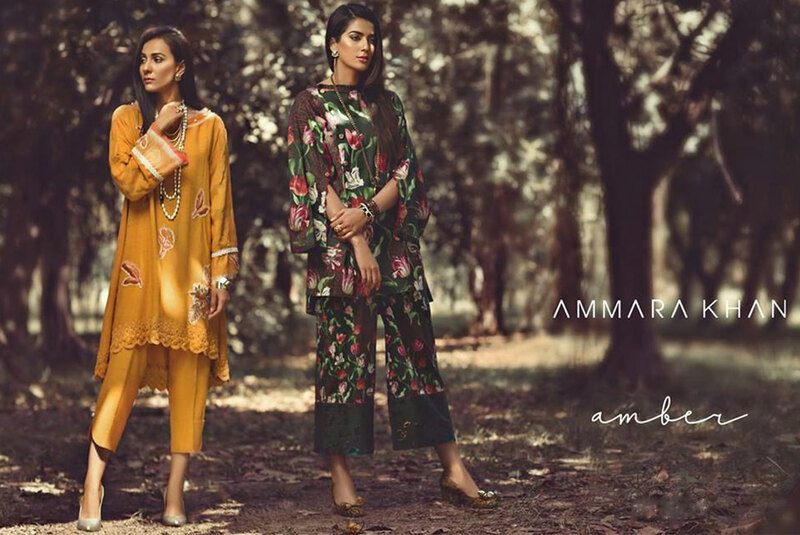 Ammara Khan’s Fall 2018 Ready to Wear Collection ‘Amber’ will be available exclusively at Ensemble Karachi on October 27, 2018 from 11 AM onward. The 48 Hour Film Project is a wild and sleepless weekend in which teams make a movie – write, shoot, and edit – in just 48 hours. It’s an international event that happens all over the world and took place in Karachi last weekend, with 23 teams competing. This Thursday and Friday you can see all the films – and vote for the audience awards! 20% Off on dinner at #koelCafe, Kids under 12 are not allowed. Something creepy is coming to the library this October! Join us on an adventure into the deep dark woods and discover spooky goings-on in the frightening tale of Hansel and Gretel! This classic story follows two children who lose their way and wander into a terrifying forest, where they stumble upon a cottage made of gingerbread, candy and sweet treats. But they soon discover that the house belongs to an evil old witch who captures them and has a devious plan! 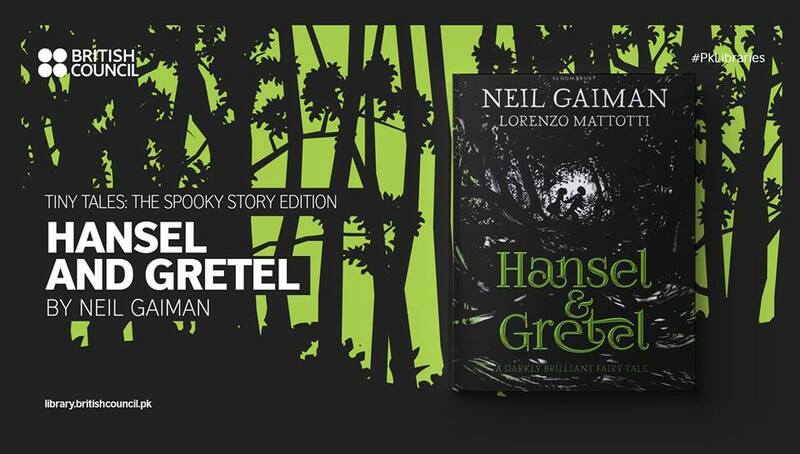 Will Hansel and Gretel outwit the witch and escape? Find out what happens at this month’s Tiny Tales. 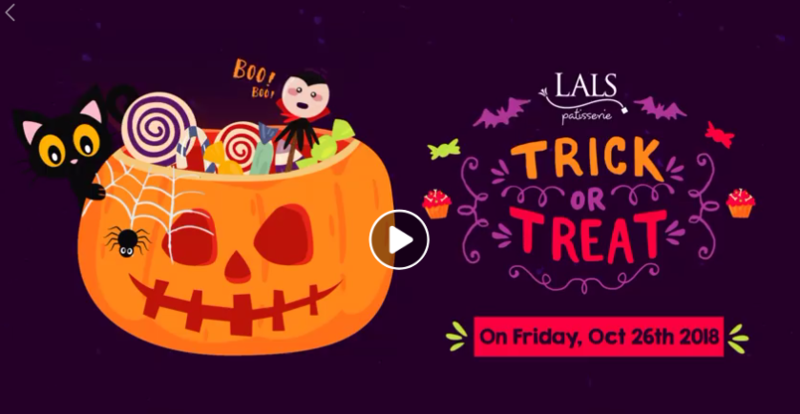 The storytelling session will be followed by spooktacular Halloween activities for children! All materials will be provided at the library. This event is suitable for ages 6 to 10 and is open to the public. Registration fee per child (payable at the door) is PKR 300 for non-members, FREE for members. Prior registration is mandatory; walk-ins will not be allowed. 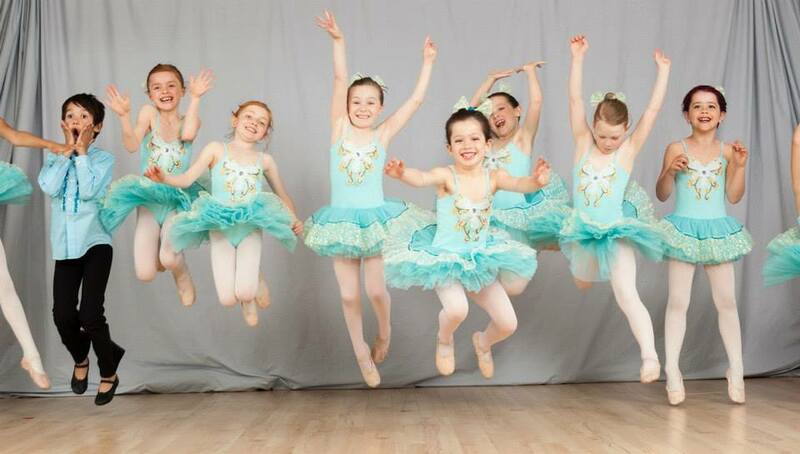 All participating children must be accompanied by a parent or guardian who has registered for the event. At the time of visit, adults MUST carry their original CNIC, Passport or Library Membership card along with a photo ID for their child, or their Library Membership card. It’s the spookiest time of the year and we’re getting into the Halloween spirit with fun DIY activities for children. This month, learn how to make frightening jack-o-lanterns and a monstrous set of googly eyes to spook your friends – or head over to our cupcake station to decorate delicious treats with ghastly frosting and more! 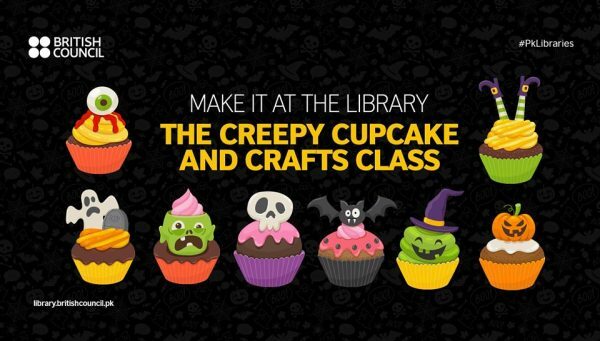 Put on your favourite costume and join us at the library for some wicked fun as we make spine-tingling Halloween decorations together. This event is for ages 6 to 10 and is open to the public. Registration fee per child (payable at the door): PKR 500 for non-members and PKR 300 for members. Prior registration is mandatory; walk-ins will not be allowed. To register, please write to us at [email protected] and send us the name and age of the participating child along with the accompanying adult’s full name and CNIC, Passport or Library Membership number. 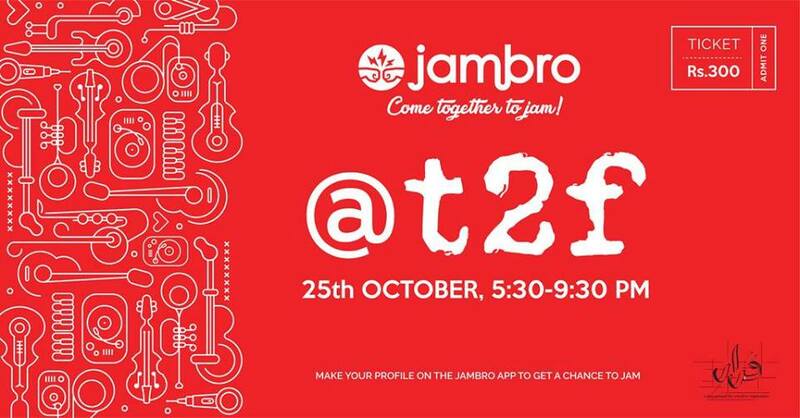 All participating children must be accompanied by a parent or guardian who has registered for the event. At the time of visit, adults MUST carry their original CNIC, Passport or Library Membership card along with the participating child’s photo ID or Library Membership card. Registration will close on Friday, 26 October 2018. 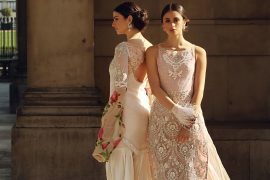 Come watch a ballet performance at the Alliance Française de Karachi art gallery on 30 October 2018 from 3:30 to 4:30 PM. Free entry, all welcome. Join us at Faraar Gallery, T2F, for the latest performance in our Sur Ka Safar series, featuring Sagheer Ahmed on vocals, accompanied by Ashiq Ali on tabla and dholak on Saturday, 27th October 2018. Sagheer Ahmed first learned music from Ustad Chand Khan of the Jaipur gharana. He also learned from Ustad Mubarak Ali Khan and Ustad Allauddin Khan. His training was in classical vocals and with time, he was drawn towards rendering semi-classical forms such as thumri, dadra, and ghazals and also started to include folk songs and geets into his repertoire. Sagheer has been performing on radio, television, and in live shows for the last fifteen years, which also include performances in India. 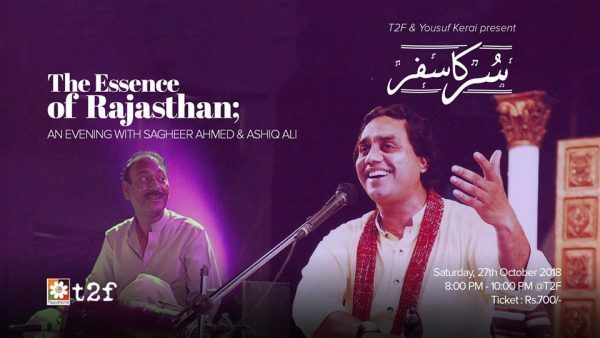 He is an ardent follower of the ghazal maestro, the late Ustad Mehdi Hasan (also of Rajasthani decent), who has greatly influenced his vocal rendition and style. In this performance Sagheer will be focusing on presenting the Rajasthani folk and semi-classical compositions. Accompanying him on tabla and dholak will be the widely acclaimed maestro, Ashiq Ali. Ashiq Ali has been working as a dholak and tabla player for the last 35 years, playing for radio, television and live performances. He learnt the basics of music and tabla playing from his father, Ustad Chand Khan, and later from the well-known tabla player, Omar Khan. He has performed with great artists such as ghazal legends Mehdi Hasan and Ghulam Ali, classical vocalist Hussain Baksh Gullo and sufi icon, Abida Parveen. However, the work that catapulted Ashiq Ali’s career into the mainstream market was with the Pakistani pop group, Junoon, wherein the dholak and tabla grooves provided by him became the identifying feature of many of their hit songs. In this performance Ashiq Ali will demonstrate the distinctive rhythmic style of accompaniment in Rajasthani folk. Do you have an Old Guitar at Home that you have outgrown and want to Sell but don’t know where to go?? Looking for Authentic Buyers? Are you Someone whose looking for a Place to Buy/Sell/Exchange your New/Used/Old Musical Instrument at a Great Price??? Want to know about the Latest trends and Innovative New Accessories in Music ?? (Guitar, Violin, Tabla, Harmonium, Keyboard, Harp, Drum Kit, Mic-Stand, Cables, Amplifiers, Mixers, Stands, Guitar Straps, Guitar Picks, etc) For the First Time EVER in Pakistan! 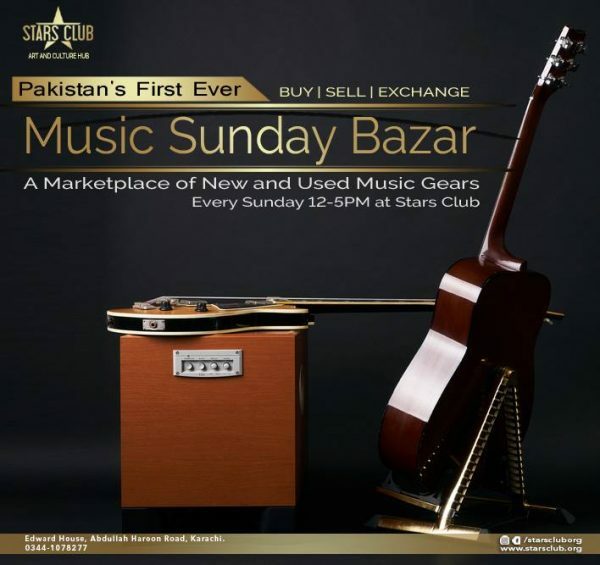 Stars Club Introduces, “Music Sunday Bazar” A Place where you can Buy | Sell | Exchange your Music Gear (i.e. Instruments, Stands, Cables, Mics, etc) Connecting Major Brands with relevant people as well as Local Vendors/Wholesalers. 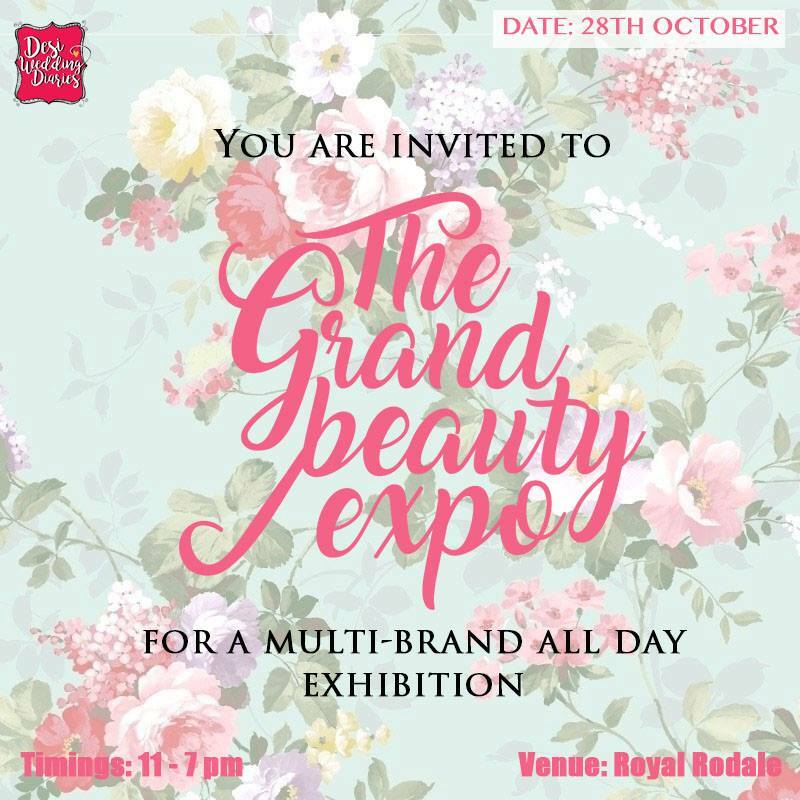 Hosted by the Desi Wedding Diaries, this multi-brand exhibition at the Royal Rodale Club will feature beauty brands and more!